In the western part of Orissa, especially in the districts of Sambalpur and Phulbani, the Dalkhai dance is performed to celebrate the autumn. It is associated with a ceremony known as Bhaijauntia which is observed by the women wishing longer life of their brothers. According to the custom prevalent in western Orissa, all the married daughters come back to their parents’ house before the Bhaijauntia that falls on the eighth lunar day of the bright fortnight of the month of Ashwin (September/October). The sisters wishing long life and prosperity of their respective brothers go with a new earthen pitcher to a stream or a river and fill the pitcher with sand from river bed. A twig of the Mahua tree is put on top of the sand. The pitcher is taken to the temple of Mahamai (the supreme mother goddess). Offerings are made to the goddess playing her to bless the brothers. While the mother goddess is being worshiped inside the temple, Dalkhai dance is performed outside. 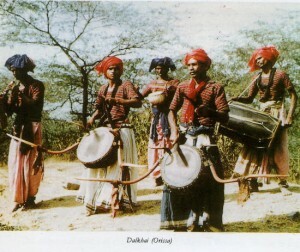 The dancers, while dancing, sing tuneful Dalkhai songs in the Sambalpuri dialect. The musical accompanists are all men. The songs, besides describing the beauty of the season, are love songs. The musical instruments used are : flute, Dhol, Nishan, a bowl shaped drum decorated with two deer horns and Timki, another smaller bowl shaped drum. Although the ritual is performed only on the first day, the dance is performed till the full moon night that comes after seven days. Like many tribal communities, the Oraons of Chhota Nagpur region of Bihar perform dance to celebrate each of the seasons. They perform Karma dance during the rains, Boroya dance during the autumn, Soharai just before the winter, Kharia during spring and Jadur, on the threshold of summer towards the end of February and beginning of March. Both men and women participate in the Jadur dance. For the musical accompaniment the instruments used are : Mandar and Dholak, both drums with two faces; Turhi, a straight trumpet; Jhanj, the cymbals; Theska, a wooden idiophone; Soynko, a circular iron rod attached with jinglebclls and shaken rhythmically.